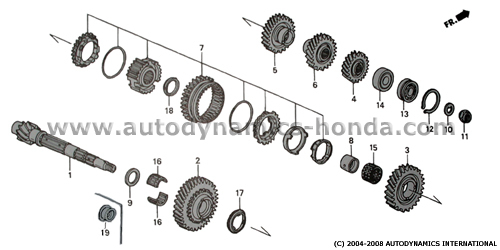 This is a sale for a brand new genuine Honda Civic CRX Del Sol Integra B16A B16B B18C DOHC VTEC D14A2 D15B3 D16A D16A6 D16A7 D16A8 D16A9 D16Z5 DOHC ZC D15Z1 D15Z3 D16Y1 D16Y2 D16Y3 D16Z6 D16Z7 D16Y7 D16Y8 SOHC ZC D15Z1 D15B VTEC Countershaft Ball Bearing for Manual Transmission 25x52x14/15 from Honda Motors, NTN, Japan. It will fit the aforementioned applications from 92-01 B-series DOHC VTEC 88-01 D-series & ZC manual transmissions manual transmissions. 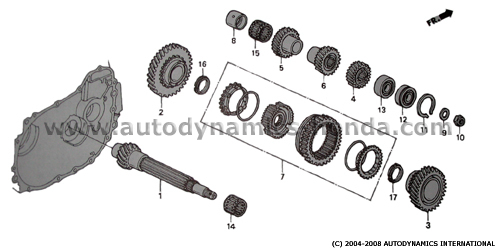 This countershaft ball bearing (No.13 in the B-series DOHC VTEC hydraulic transmission countershaft components diagram and No.12 in the D-series ZC cable & hydraulic transmission countershaft components diagram below) is located at the countershaft end.